Summer is my favorite season. I love the heat! Which isn’t really something you hear coming from many Georgians. But to me summer means the kids are out of school and we will be spending a lot of time outdoors and in the water. 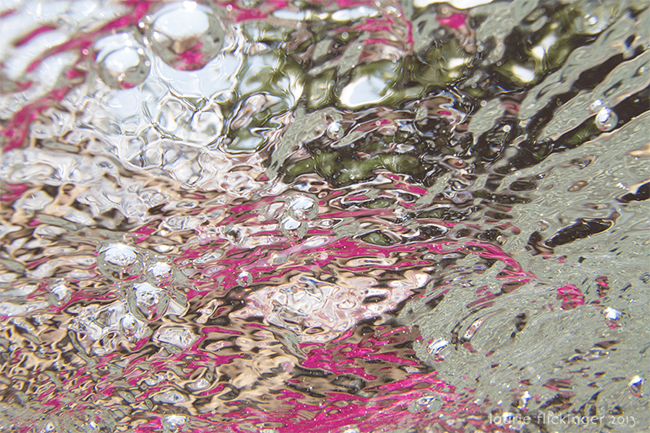 So, naturally, I became interested in underwater photography as it has gotten popular was the past few years. 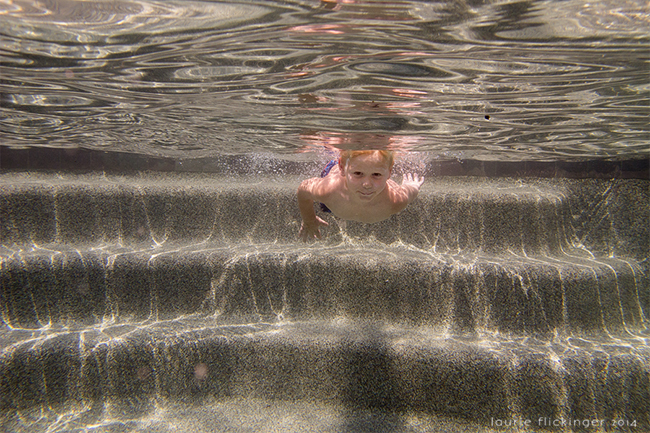 My family enjoys days at the pool and boating, so a water proof camera became a “necessity” if I wanted to capture the essence of these outings. I was also in need of a point and shoot camera to carry along in my purse or as a lightweight option to my DSLR and lenses, so I decided to do a little research and kill two birds with one stone, so to speak. After a great deal of research, I decided on the Canon G12 (I feel like a traitor! I’m a Nikon girl!) and an underwater housing. While there are off brand options for the underwater housing, I went with the Canon G11/G12 Underwater Housing in order to be able to use most of the functions of the camera with the case on. To cut costs, I bought the Canon G12 refurbished from Canon (the newer version had just come out) and the underwater housing was cheaper for the older model at the time. Available at the time this article is published is the Canon G16 and Underwater Housing. So far, I have been very happy with both the point and shoot and the underwater housing. And if you think you get weird looks after pulling out your DSLR and big lens, just wait until you break out one of these! And then put in water! :) You are sure to get a comment or two! 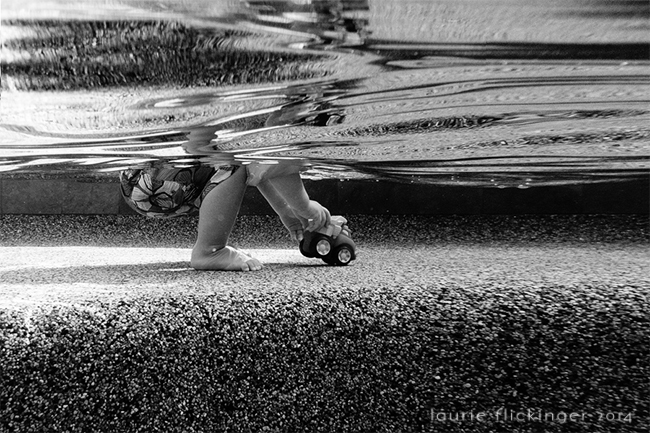 What do you need for underwater photography? 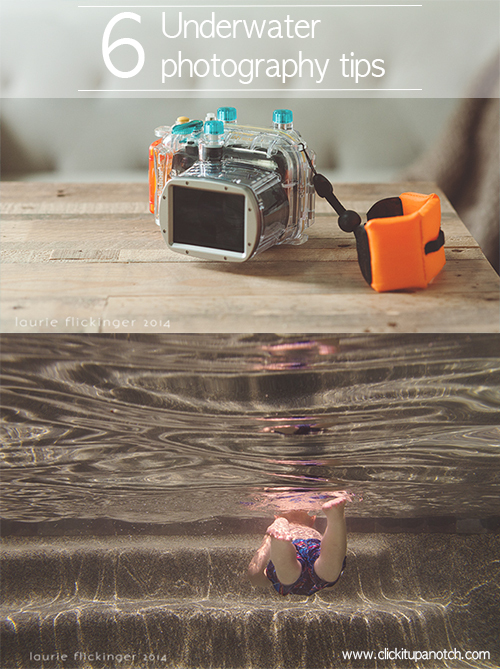 First off, an underwater camera, or camera and underwater housing, which I mentioned mine above. Other options include the GoPro, Panasonic Lumix, Nikon Coolpix (I had to throw a Nikon in there!). Of those, I would choose the GoPro. I’ve heard a lot of great things about it and have seen a lot of fun videos taken with it too. It’s actually on my wish list. A pair of goggles is a must. It is always good to actually be able see what you are photographing! I haven’t bought my own pair, so I usually just grab a pair that the kids aren’t using. I do prefer the larger masks over the smaller goggles. They seem to seal a little better and make visibility a little easier under water. Safety first! I bought a wrist band float for my camera so that if I drop it in the lake, it isn’t gone forever. I have this one by Cowboy Studio. It is cheap, but it gets the job done. And last, if you are using an underwater housing, I recommend following the instructions included with the housing to ensure the seal is tight and indeed waterproof. Basically you grease the rubber seal and ensure that it fits properly. I also put one of those silica gel “do not eat” packets inside of the housing just to be safe. Oh! 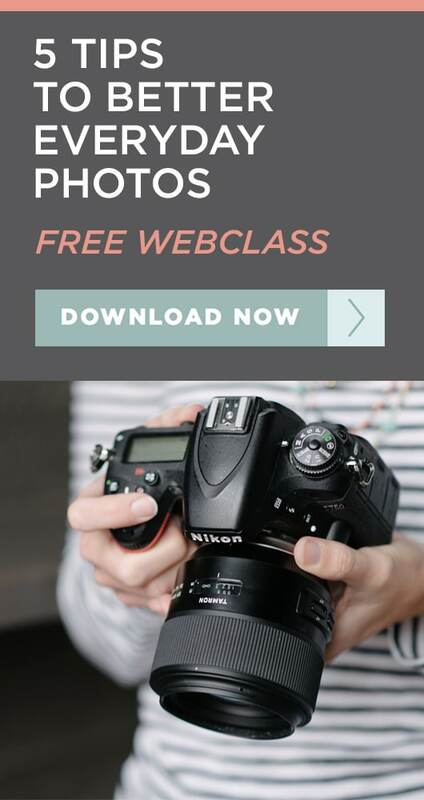 And of course, grab a subject! And believe it or not, the kids will be all about it!!!! Yes! I have finally found a camera that the kids love to be in front of! It really is a win, win for all of us! 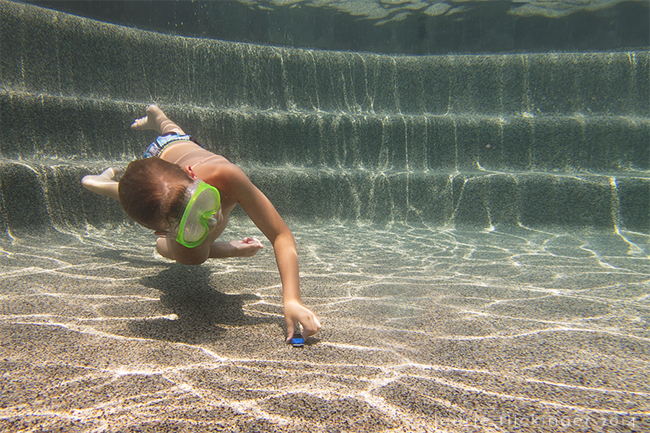 Underwater photography is a whole new ball game! So, don’t get too frustrated if you don’t get any wow! images on your first try. The lighting is tricky. The color of light underwater is much different. It is literally a whole new world under water. To make your first try a bit easier, know your camera. Trying to get your camera set up underwater isn’t easy, so knowing the controls (especially when using manual on your camera) is important. 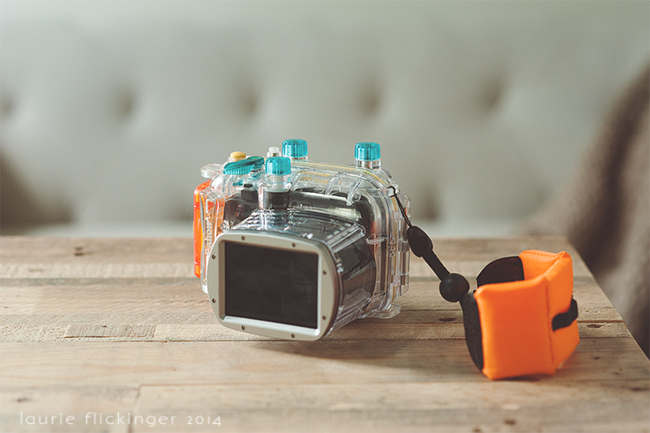 Learn how to use all of the buttons with the underwater housing. For me, switching to a new camera was hard enough, but then putting it in a housing made it even more difficult. So, spend a little time playing with the settings before putting it in the water. It will save you a little frustration. It also helps to set up your camera the way you need it before you put it in the housing (or underwater) then just adjust the exposure once it is emerged. The less functions to change in the water, the better. Lighting underwater is vastly different than lighting in sun or overcast conditions. 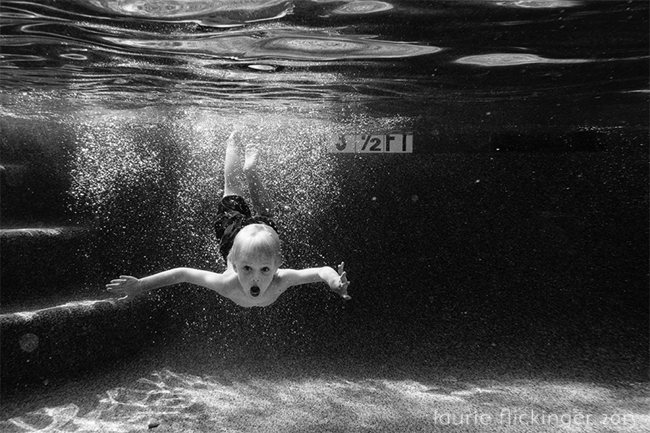 Underwater, lighting is just as important as it is above water, but it acts differently. When I first played with my underwater camera, I thought that I would play it safe and use the overcast “safe” lighting that I was comfortable with when I first starting using a DSLR. Well, underwater, overcast means flat, boring light. Even flatter than above water. Almost monotones. And a black and white conversion won’t even begin to help you. The light fall off is much greater, meaning the deeper your subject is from the surface, the less light is going to fall onto the subject and the more flat it will be. So, when planning your exposure, the deeper your subject is in the water, you’ll need to increase your exposure by adjusting ISO, shutter speed or aperture. 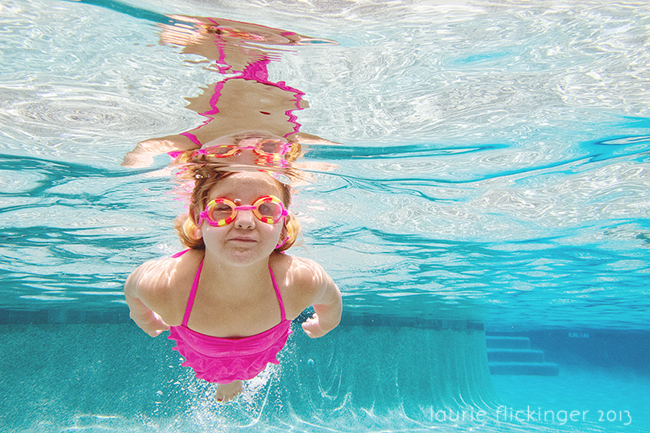 The closer your subject is to the surface of the water, the more light will fall onto your subject. Light equals more visual interest. Directional lighting is great, but a little more difficult in water than out of water. The timing of day is more important for directional lighting. Here is a couple of examples comparing lighting. Directional: Notice the areas of shadow to the right and background. 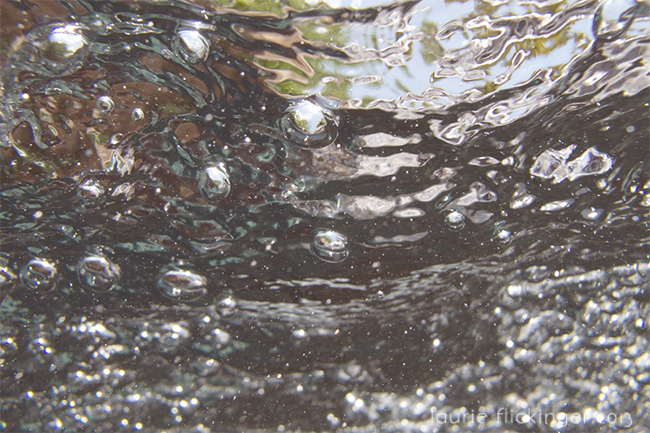 The clarity of the water can affect your images. The farther away from the camera your subject is, the more likely that the clarity of the water will affect your image quality. If the water is crystal clear, great! But likely there will be a bit of cloudiness that you won’t normally notice without a camera. The water appears much clearer until you are literally taking pictures of it. To help with this, zoom out or use a wide angle lens and get closer to your subject to close the distance. That way you’ll still have the scene captured, but with more clarity than if you stepped away and zoomed in. Also the further away from your camera, the more the white balance will turn blue underwater. Water absorbs red wavelengths first, so the more water between your camera and your subject, the more blue/cyan the subject will appear. This translates to the closer your subject is to your camera, the better your white balance will be. So follow the same rule for clarity and use a wide angle and get physically closer to your subject to help with WB, or get used to more processing after uploading your images. Notice that the more distance away from the subject, the more blue the water is in the background. Framing is just as important, but much more difficult underwater. It is hard to in one place underwater! 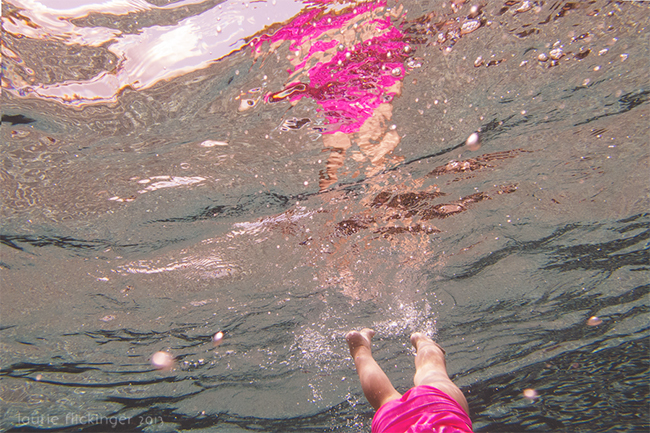 The natural buoyancy of your body causes you to float up if you are deeper in the water. Do the best that you can to plan out your image (just as you would above water) before you take the picture. It’s good to at least have an idea of what you want before you are underwater and shooting away. Keep an eye on your shutter speed to make sure you have a little wiggle room for motion (of both yourself and your subject!). Also, keep in mind that your underwater camera may take pictures in different dimensions than the DSLR that you are used to. My Nikon’s images are a 2:3 or 4:6 ratio, where the images on the Canon G12 are 3:4, which are a bit more square, which caused me a few issues when cropping in post processing. (I like to keep them all consistent at 2:3). So, in some images, I needed to stretch the canvas to make it work. Because the red wavelengths are absorbed first, you’ll need to add a lot of red and yellow back into the image to correct the skin tones….unless you have a fetish for cyan people. The “underwater” setting on the camera does a half decent job of adding some red back into the image, but I’ve noticed that I need to adjust more when I get the images into light room. The following example is a untouched image with regard to WB (it was on auto, yuck!). I use Lightroom to edit my raw files, then take my images into photoshop for final edits. I’m old school, I know! So, in Lightroom, the first thing I usually do is take a look at exposure. The white balance was so off in this one, that it is a little difficult to determine how far off the exposure is! So, I decided to change the white balance first. Sometimes when the white balance changes, the image can look brighter. I know that the tiles in our neighborhood pool are slate/gray. So, I used the dropper to see if that would be a good place to start. It was! From there I adjusted the temperature and tint until I liked what I saw (by eye). I haven’t checked the numbers to double check my skin tones, but they look pretty good to me, so I skipped that step. 6. Other tips in underwater shooting. Holding your breath is a tough one! 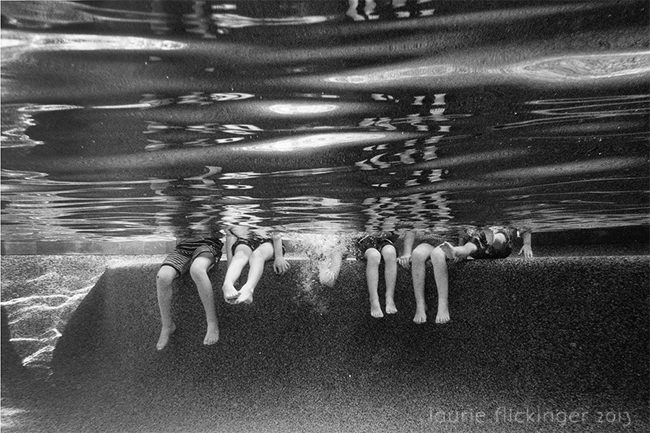 You’ll be exhausted after an underwater shoot. 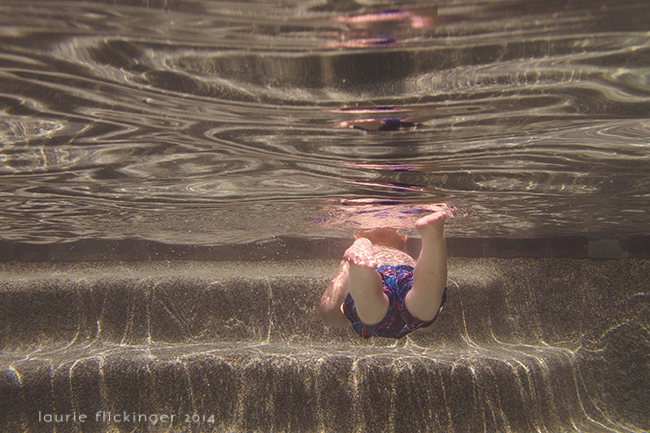 I don’t really have any tips for this one, but for shallow underwater shooting, a snorkel may come in handy. Take advantage of the LCD. It is much easier to look at the LCD than through the eyepiece underwater. It felt really weird to me at first, since I’m used to using a DSLR, but I quickly realized that a big screen is great underwater. And as always, practice! Practice different lighting scenarios and see what works best for you! Different scenes and processing can bring a whole new look to your underwater images. From light and airy to quite creepy! Have fun shooting! great article. I have an olympus tough P&S that is so fun underwater! 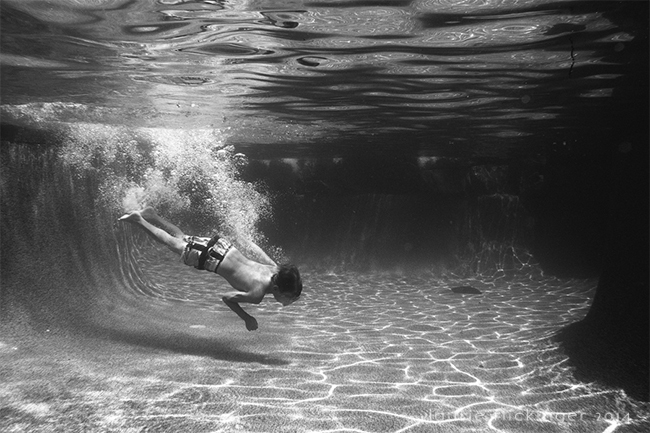 Wow I really want to get an underwater camera now, your shots are absolutely beautifull! Good day, Laurie! Superb tips and real life photo samples. Thanks for the underwater photography tips. I don’t own an underwater camera, but I would like to one day. Thanks again. Thank you for this! What a great article! So clearly written with superb example shots! Laurie, I have been a photographer for most of my 66 years. A Canon user (1970-2000) and switched over to Nikon the past 15 years. Bottom line is that I ENJOYED reading your information on ‘underwater’ shooting. I’m planning to do my FIRST photos while snorkeling, later this month. A day in Turks/Caicos, a day in San Juan and a day in St. Martens. Those are the stops on a 7 day Caribean cruise. I bought a Nikon Coolpix for my photos. I find it tough to use after using SLRs and fast lenses for the past 45 years !!! Your information has been quite helpful. THANK YOU !!! Barry Galerno, Windsor, Ontario, Canada. Sony provides a good deal of digital cameras and is among the largest manufactures of digital cameras worldwide. The ideal place to locate Sony camcorders, DSLR’s and mirrorless digital cameras it is an remarkable brand that offers a range of devices acceptable for many different people and budgets. It has beenpumping out amazing cameras for the past few years. The way the camera feels in the hand is an enormous element in what kind of shots you’re most likely to become from it. The Sony a6000-series cameras are extremely similar in configuration and dimension. Sony’s new highest-end cameras utilize the more compact E-mount. With three main kinds of Sony digital cameras, you will have to be certain the camera fits with your wants and requirements. To have the ability to compensate for the lack of better sensitivity due to their small sensors, the majority of the bridge cameras have an image stabilizer system imbibed from the scheme of things so that it’s ready to face up to longer exposures. Mirrorless cameras are now hugely popular lately. 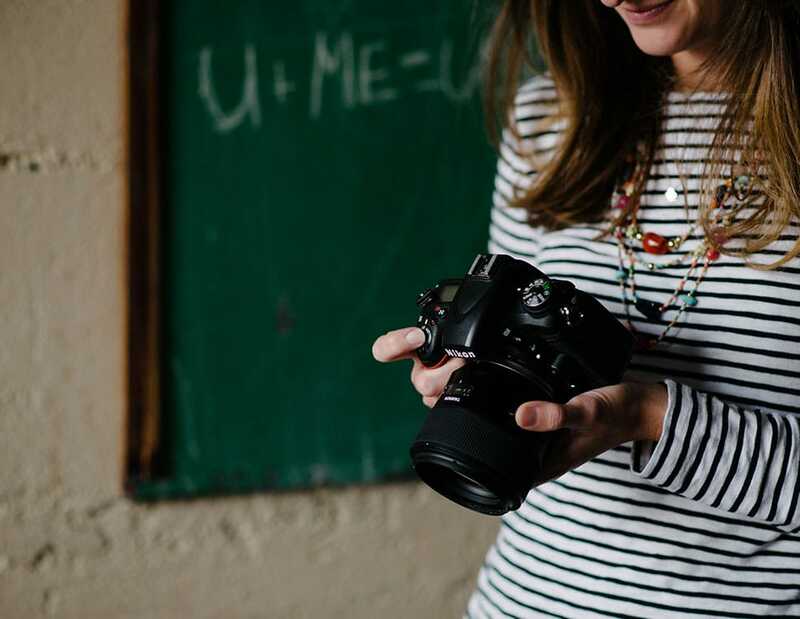 These fashionable and compact cameras epitomize the saying factor-and-shoot. It’s certainly the very best 4K camera out there before you commence considering dedicated expert video cameras. If you’re able this camera, however, you are likely to be somewhat pleased with its capability to supply wonderful images and quick autofocus, places where the Sony Alpha 6300 compares very favorably with entry-level DSLR cameras. Digital SLR cameras supply a high number of features and a mix of the optics and mechanics.